STEPPING OUT OF the Métro station La Chapelle in the 18th arrondissement it’s easy to forget that you’re in Paris. Historically a working class area with a predominantly immigrant population, the Quartier de la Chapelle is lively and extremely cosmopolitan. A large Sri Lankan community together with smaller Turkish, Pakistani and Chinese communities as well as an influx over the last ten years or so of ‘bobos’ (a term coined by the American journalist David Brooks to describe a group of “highly educated folk who have one foot in the bohemian world of creativity and another foot in the bourgeois realm of ambition and worldly success”) make La Chapelle a diverse and fascinating neighbourhood. The Quartier de la Chapelle straddles the array of railway tracks entering both the Gare du Nord and the Gare de l’Est and it is in rue Pajol, a street alongside the railway approaching the Gare de l’Est, that an impressive urban renewal project has been undertaken. Originally known as rue de la Gare du chemin de fer de Strasbourg, the name rue Pajol was adopted in 1865 in honour of Général d’Empire Pierre Claude Pajol, a distinguished cavalry officer in Napoléon’s Grande Armée. An interesting fact about rue Pajol is that in 1870, Joseph Meister and Marie-Angélique Sonnefraud married and settled at N° 22. In 1885, their nine-year old son, also Joseph Meister, was bitten by a rabid dog. He became the first person to be inoculated against rabies by Louis Pasteur and the first person to be successfully treated for the infection. Today, the Hindu Temple de Ganesh de Paris Sri Manicka Vinayakar Alayam dedicated to Genesha, the Hindu deity of wisdom, propriety and good fortune, stands at the southern end of rue Pajol while at the northern end, adjacent to the railway tracks of the Gare de l’Est, is the impressive Halle Pajol, which opened early in 2014 after three years of construction work. 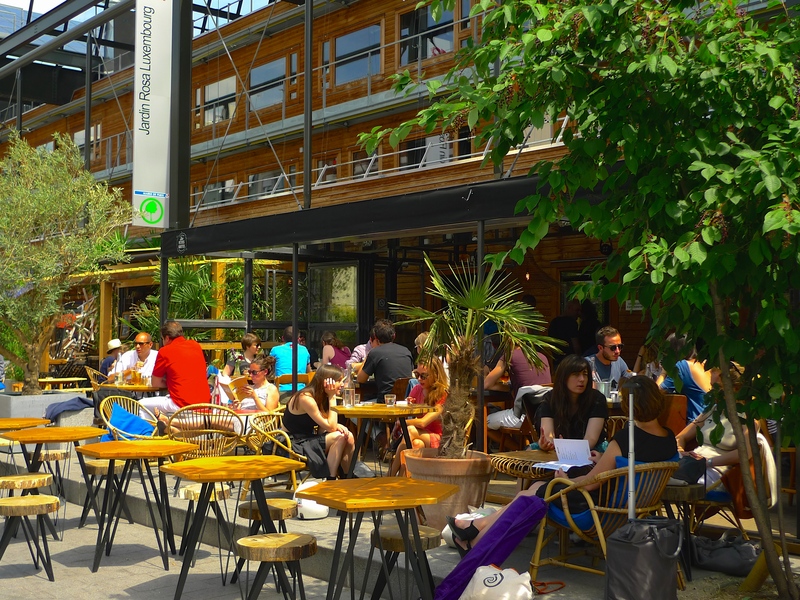 Funded by the City of Paris and designed by JAP (Jourda Architectes Paris) led by Françoise-Hélène Jourda, the new Halle Pajol emerged from an old SNCF warehouse built in the 1920s but long since abandoned. The City of Paris bought the site in 2004 and earmarked it for redevelopment. The idea was to enhance the district by providing increased public amenities and improving the urban landscape through the creation of green spaces while preserving the architectural heritage of the original building. What had become an unsightly piece of industrial archaeology has now been transformed into a centre for the community comprising the largest youth hostel in the capital, a library – the Vaclav Havel Library (named after the former President of the Czech Republic), offices, an auditorium, shops, a bakery and cafés. The Halle Pajol has been designed with sustainability in mind. Along with its elegant wooden frontage it produces its own electricity from 3,500 M2 of photovoltaic panels in the roof. 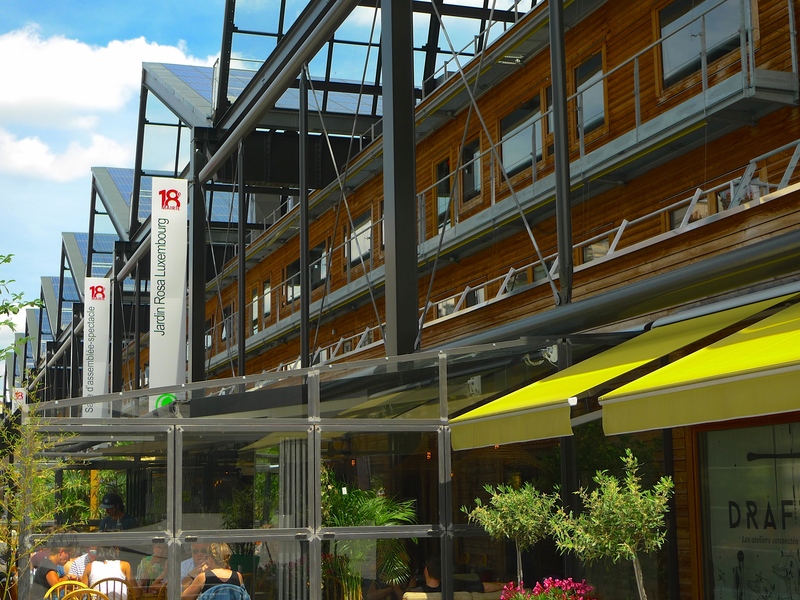 As well as the Halle Pajol itself, this urban development also includes some 9,000 M2 of green space. 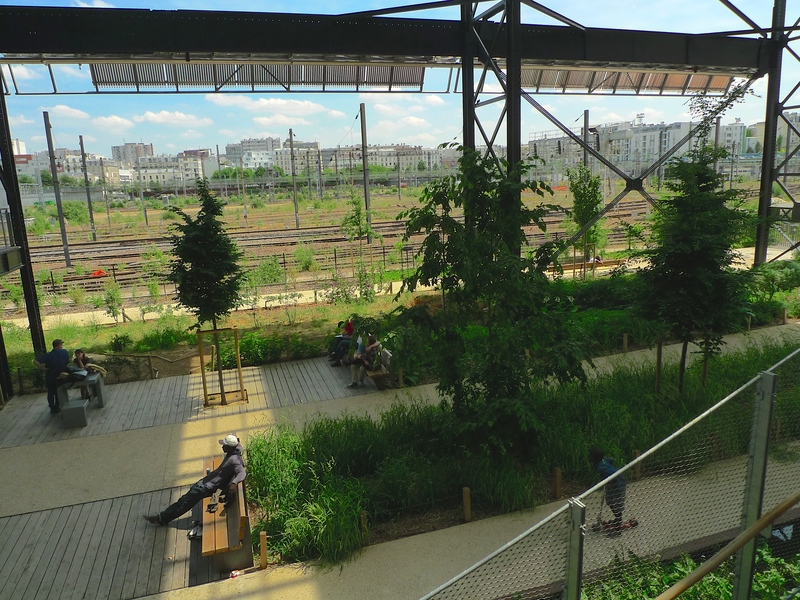 Named after the philosopher, economist and revolutionary socialist, Rosa Luxemburg, the Rosa Luxemburg Gardens comprise covered and uncovered gardens stretching alongside the railroad tracks blending in with the surrounding landscape. 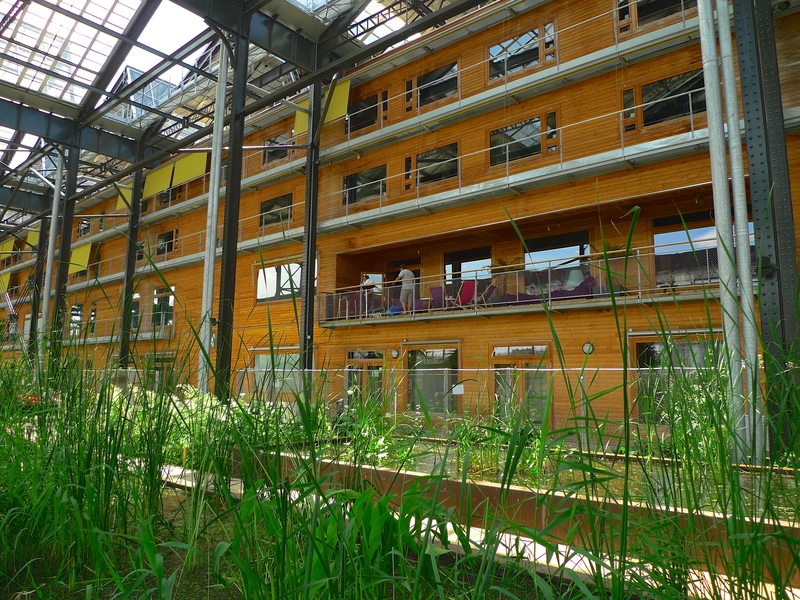 As with the Halle Pajol, ecology rhymes with economy. Almost all materials used in the gardens, the crushed tiles, the pavers and the rails, all come from the original building. 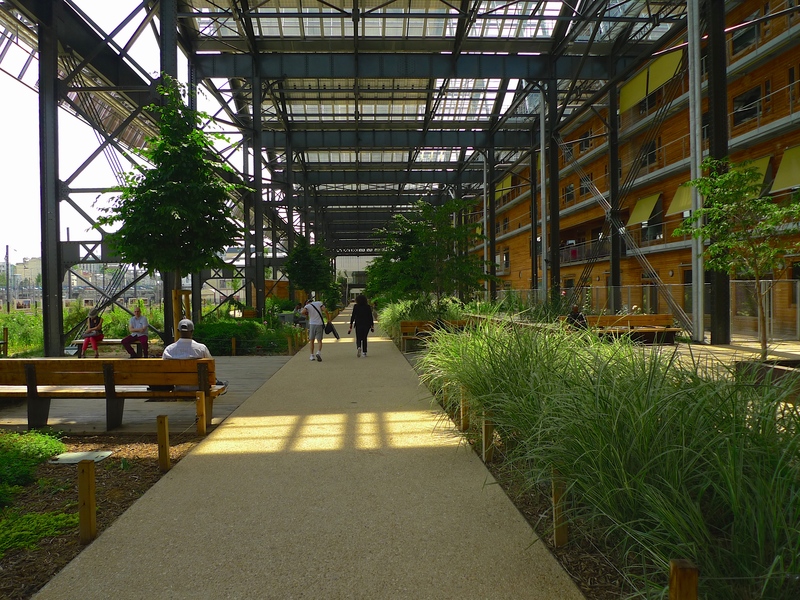 Under the Halle Pajol, a 2,500 M² covered garden provides a quiet space; a place to stroll and discover a variety of plant species including birch, cedar, wild flowers and aquatic plants. The garden is irrigated by rainwater collected on the roof. The covered garden extends outside and includes play areas for children. 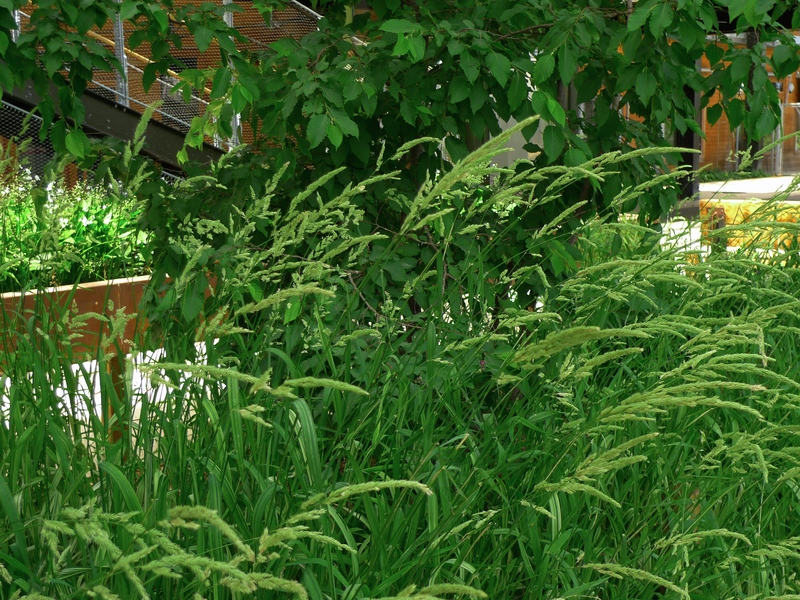 Outside, the garden is covered with decontaminated soil to a depth of one metre and is planted with local species including pine, ash, mountain ash and flowering cherry. 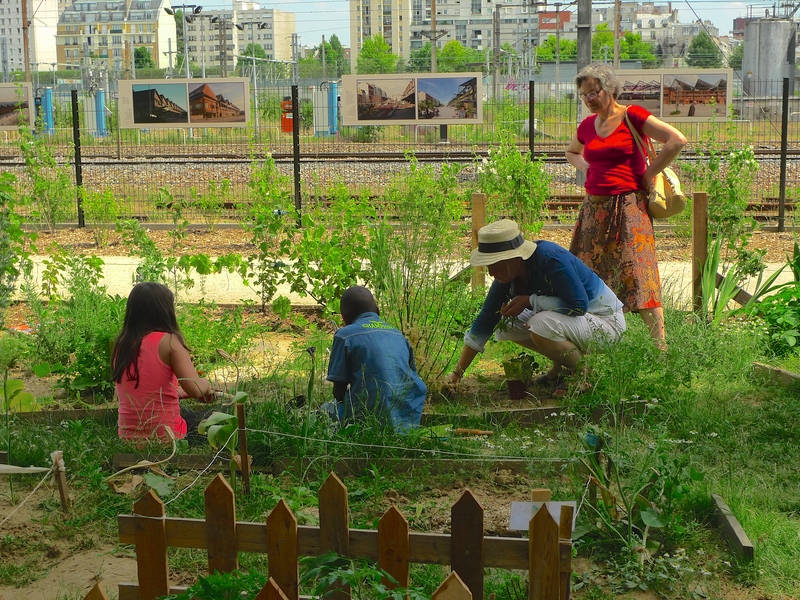 Alongside the rail tracks, two plots of 100 M2 kitchen gardens have been established and made available to neighbourhood associations. Local residents can go there and grow flowers or vegetables. In addition, small plots are available for children to create their own gardens. In the north, the garden follows the topography leading pedestrians by successive slopes out onto rue Pajol and rue Riquet. 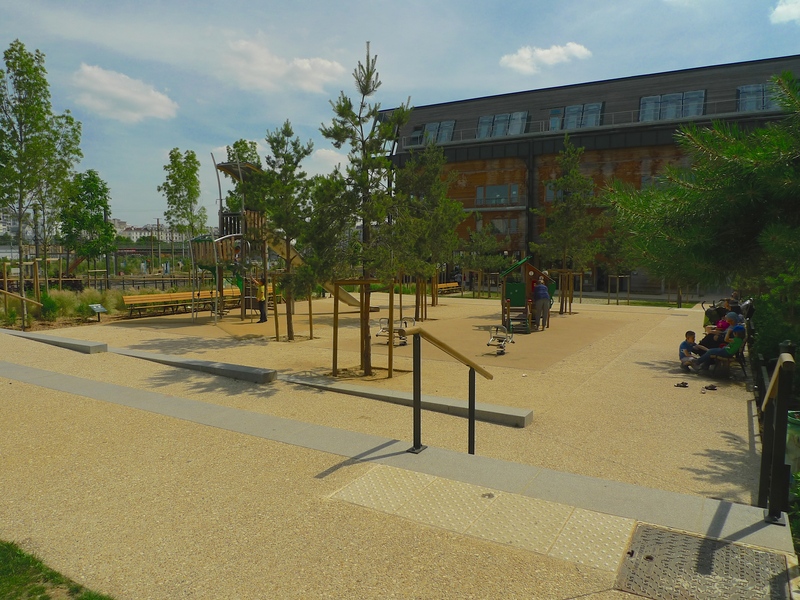 In the last few weeks a 1,010 M² extension to the Jardin Rosa Luxemburg has been opened with two lawns and a wooden playground suitable for children from 3 to 8 years, which includes a giant wooden elephant, giraffe and crocodile. Sadly, the award-winning architect and driving force behind the Halle Pajol and the Jardin Rosa Luxembourg, Françoise-Hélène Jourda, passed away on 31st May 2015. This post is dedicated to her memory. “small plots are available for children to create their own gardens.” – hello Dublin City Council, are you reading this?…. Thanks Susanna, I really hope your comment hits the spot. I disagree with the Paris City Council about many things but I’m the first to admit that they do get some things absolutely right. I watched the two children in the picture for quite a long time and they worked like beavers on their little plot. As you can hear in the sound piece, the lady was giving them encouragement and they all seemed to be thoroughly enjoying themselves. It was a real pleasure to see. You’re right, Des: I would never have imagined this spot to be in Paris. It’s utterly unexpected — and fascinating, as a work of eco-architecture! It’s interesting, too, that your recording sounds so *unlike* Paris (to my surprise, I rather missed the familiar scooters and ambulance sirens). But I think my favorite thing about this post is your tribute to Françoise-Hélène Jourda at the end. May her creativity and ingenuity inspire others to follow in her footsteps. 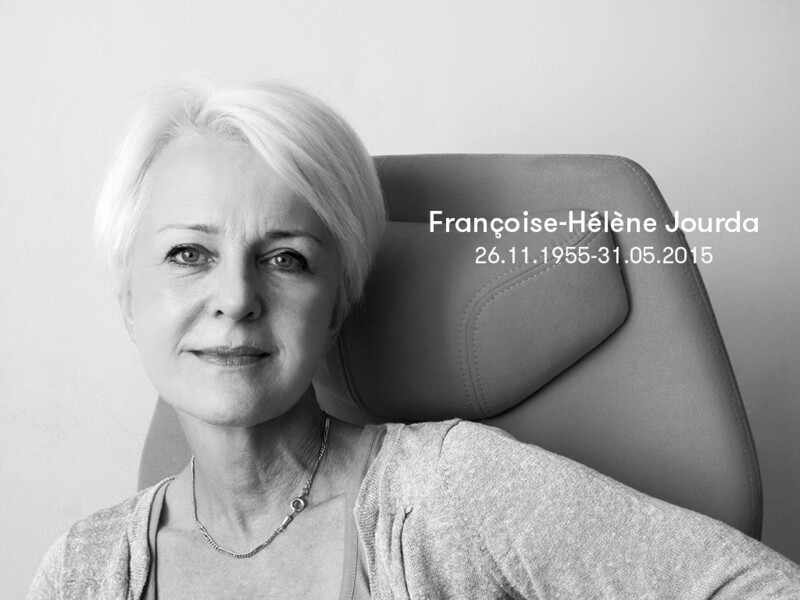 Françoise-Hélène Jourda was well known for her focus on sustainability in her architectural work. The Halle Pajol is just one example but there are others like le Musée botanique de Bordeaux, l’aménagement des berges du Rhône à Lyon and l’hôpital privé Jean Mermoz à Lyon. She won many awards for her work not least the Global Award for Sustainable Architecture in 2007. She was also honoured by the French State with the award of Chevalier de l’Ordre de la Légion d’Honneur. And, much closer to you, she taught architecture at the University of Minnesota. She will be much missed. What a distinguished career she had, Des — and what a wonderful legacy she created. I had no idea about the MInnesota connection, though, and find myself wondering whether any of my architect friends may have been students of hers. I will have in inquire.